The USGS (United States Geological Survey) has a network of stations that report river and stream data (see http://waterdata.usgs.gov/nwis/rt) One gauging station is for Shoal Creek and located at 12th Street. (link http://waterdata.usgs.gov/usa/nwis/uv?08156800) Data typically are recorded at 15- to 60-minute intervals, stored onsite, and then transmitted to USGS offices every 1 to 4 hours, depending on the data relay technique used. Recording and transmission times may be more frequent during critical events such as serious flooding. A new feature enables the configuration of email or txt alerts based on specified water levels or discharge rate. 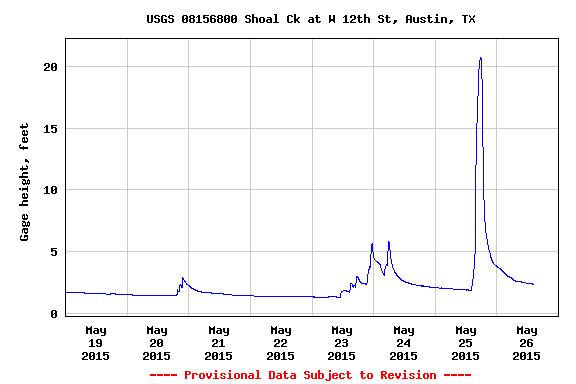 USGS stream data for Shoal Creek – gauging station located at 12th Street.